Remove engine and transaxle assembly from the vehicle. Refer to EM-82, "M/T : Exploded View" (M/T) or EM-86, "CVT : Exploded View" (CVT). Remove the clutch cover and clutch. Refer to CL-17, "Exploded View". Remove the flywheel or drive plate. Refer to EM-90, "Exploded View" (M/T) or EM-92, "Exploded View" (CVT). 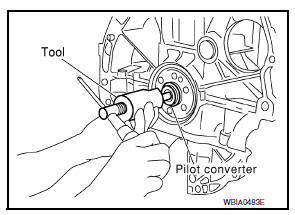 Remove pilot converter using Tool. Remove the rear oil seal. Refer to EM-70, "REAR OIL SEAL : Removal and Installation". 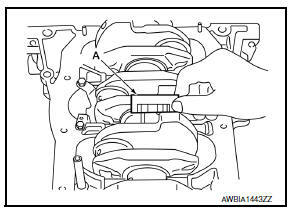 Do not damage the crankshaft or cylinder block when removing the rear oil seal. Remove flywheel or drive plate. Refer to EM-90, "Exploded View" (M/T models) or EM-92, "Exploded View" (CVT models). Remove pilot converter. Refer to EM-92, "Exploded View" (CVT models). Lift the engine with a hoist to install it onto widely use engine stand. Use the engine stand that has a load capacity [approximately 135 kg (298 lb) or more] large enough for supporting the engine weight. If the load capacity of stand is not adequate, remove the following parts beforehand to reduce the potential risk of overturning stand. 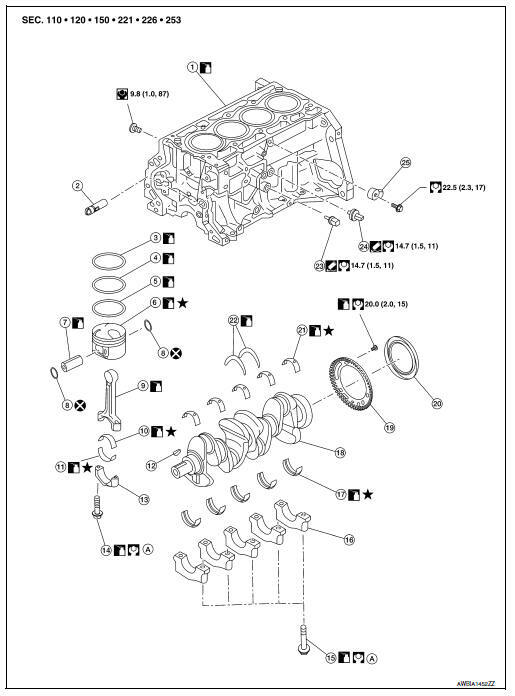 Intake manifold: Refer to EM-27, "Exploded View". Rocker cover: Refer to EM-46, "Exploded View". 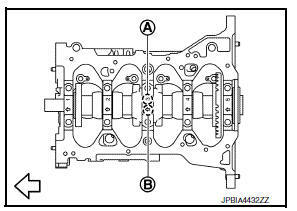 The illustration shows an example of widely used engine stand (A) that can support mating surface of transaxle with flywheel (M/T models) or drive plate (CVT models) removed. Before removing the hanging chains, check the engine stand is stable and there is no risk of overturning. 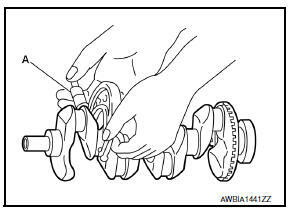 Drain fluids and lubricants by removing drain plugs (1, 3 and 4) the cylinder block. 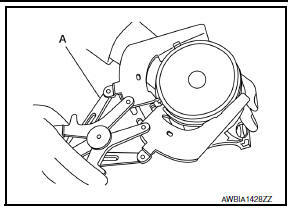 Tightening torque : Refer to EM-95, "Disassembly and Assembly". Remove the oil pan (upper). Refer to EM-33, "Exploded View". Remove the water pump. Refer to CO-19, "Exploded View". Remove thermostat housing. Refer to CO-21, "Exploded View". Remove the water outlet. Refer to CO-24, "Exploded View". Remove the cylinder head. Refer to EM-72, "Exploded View". Carefully handle sensor avoiding shocks. 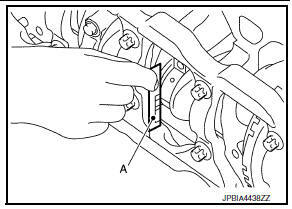 Remove the oil pressure (3) and oil temp sensor (4). Before removing piston and connecting rod assembly, check the connecting rod side clearance. Refer to EM-103, "Inspection". Position crankshaft pin corresponding to connecting rod to be removed onto the bottom dead center. Remove connecting rod cap. Number connecting rod caps so they can be assembled in the same position and direction. 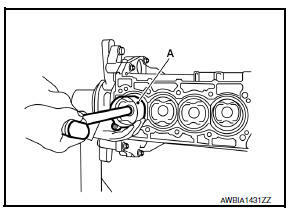 Using a hammer handle or similar tool, push piston and connecting rod assembly out to the cylinder head side. Do not damage matching surface with connecting rod cap. 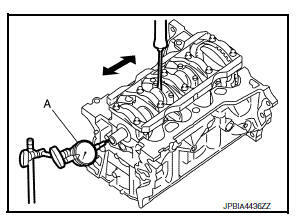 Do not damage the cylinder wall and crankshaft pin, resulting from an interference of the connecting rod big end. When removing them, note the installation position. Keep them in the correct order. Remove piston rings from piston. 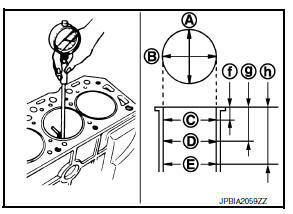 Before removing piston rings, check the piston ring side clearance. Refer to EM-103, "Inspection". Remove piston rings using suitable tool (A). When removing piston rings, be careful not to damage the piston. Do not damage piston rings by expanding them excessively. Using snap ring pliers (A), remove snap rings. Heat piston to 60 to 70В°C (140 to 158В°F) with a heat gun (A). Push out piston pin using a punch of outer diameter approximately 18 mm (0.71 in). Remove main bearing cap bolts. Measure crankshaft end play before loosening main bearing cap bolts. Refer to EM-103, "Inspection". 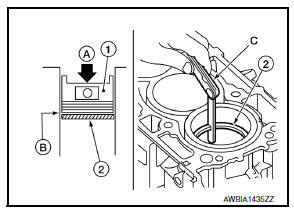 Loosen and remove main bearing cap bolts in reverse order as shown. Tap main bearing caps lightly with a plastic hammer for removal. Number main bearing caps so they can be assembled in the same position and direction. Do not damage the mounting surface. 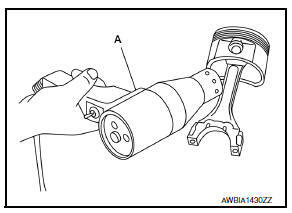 Do not damage or deform signal plate (1) mounted on rear end of crankshaft (A). When setting crankshaft on a flat floor surface, use a block of wood to avoid interference between signal plate and the floor surface. Do not remove signal plate unless it is necessary to do so. Remove main bearings and thrust bearings from cylinder block and main bearing caps. Fully air-blow engine coolant and engine oil passages in cylinder block, cylinder bore and crankcase to remove any foreign material. 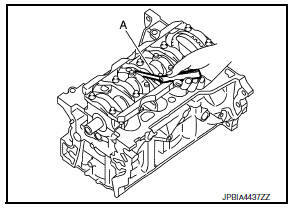 Install each plug to cylinder block as shown. 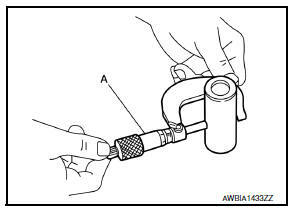 Apply liquid gasket to the thread of water drain plug (4). Apply sealant to the thread of plug (1). 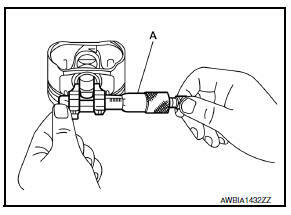 Do not apply liquid gasket or high strength thread locking sealant to the plug (3). Tighten each plug as specified below. Remove dust, dirt, and engine oil on the bearing mating surfaces of cylinder block and main bearing cap. Install thrust bearings to both sides of the No. 3 journal housing (B) on cylinder block. Install thrust bearings with the oil groove (A) facing crankshaft arm (outside). Install the main bearings paying attention to the direction. Before installing main bearings, apply new engine oil to the bearing surface (inside). Do not apply new engine oil to the back surface, but thoroughly clean it. When installing, align main bearing to the center position of cylinder block and main bearing cap. The difference (A) between main bearing (upper) (1) and main bearing (lower) (3) should be 0.85 mm (0.0335 in) or less when installing. 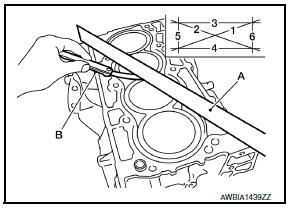 Ensure the oil holes on cylinder block and oil holes (A) on the main bearings (1) are aligned. Install signal plate to crankshaft if removed. Set the signal plate with the flange facing toward the counter weight side (engine front side) to the crankshaft rear surface. Apply new engine oil to threads and seat surfaces of bolts. Position crankshaft (2) and signal plate (1) using a dowel pin, and tighten bolts in numerical order as shown. Dowel pin of crankshaft and signal plate is provided as a set for each. Be sure to remove dowel pin. Install crankshaft to cylinder block. While turning crankshaft by hand, check that it turns smoothly. Install main bearing caps referring to the journal No. stamp (A) and front mark (B) as shown. Main bearing cap cannot be replaced as a single part, because it is machined together with cylinder block. Tighten main bearing cap bolts in numerical order as shown. Confirm the tightening angle by using Tool (A). Do not judge by visual inspection without the tool. After installing bolts, check that crankshaft can be rotated smoothly by hand. Check crankshaft end play. Refer to EM-103, "Inspection". Using snap ring pliers, install new snap ring to the groove of the piston rear side. Insert it fully into groove to install. Assemble piston to connecting rod. Using a heat gun, heat the piston until the piston pin can be pushed in by hand without excess force [approximately 60 to 70В°C (140 to 158В°F)]. From the front to the rear, insert piston pin into piston and connecting rod. 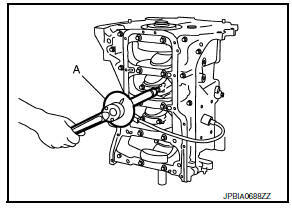 Assemble so that the front mark (A) on the piston head and the oil hole (B) and the cylinder number (D) on connecting rod are positioned as shown. Install new snap ring to the groove of the piston front side. After installing, check that connecting rod moves smoothly. Do not reuse snap rings. Using a suitable tool, install piston rings. Position each ring with the gap as shown referring to the piston front mark. Do not contact the rail end gap under the oil ring with the oil drain cast groove of piston. Install second ring with the stamped surface facing upward. Install connecting rod bearing upper (2) and lower (3) to connecting rod (4) and connecting rod cap (4). Install the connecting rod in the direction shown. Check that connecting rod bearing oil hole (A) is completely in the inside of connecting rod oil hole chamfered area (B). When installing connecting rod bearings, apply new engine oil to the bearing surface (inside). Do not apply new engine oil to the back surface, but thoroughly clean it. There is no positioning tab. Install the connecting rod bearings in the center of connecting rod and connecting rod cap as shown. For service operation, the center position can be checked, visually. Install piston and connecting rod assembly to crankshaft. Position crankshaft pin corresponding to connecting rod to be installed onto the bottom dead center. Apply new engine oil sufficiently to the cylinder bore, piston and crankshaft pin. Match the cylinder position with the cylinder number (D) on connecting rod to install. Install so that front mark (A) on the piston head faces the front of engine. 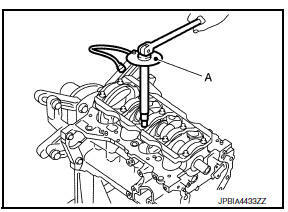 Install piston with the front mark on the piston head facing the front of the engine using Tool (A). Be careful not to damage the crankshaft pin, resulting from an interference of the connecting rod big end. Match the stamped cylinder number marks (D) on connecting rod with those on connecting rod cap to install. 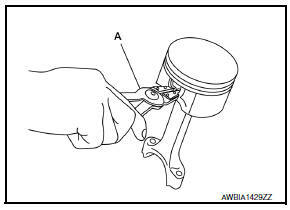 Tighten connecting rod cap bolt using Tool (A) as follows: Apply new engine oil to the threads and seats of connecting rod cap bolts. Check that there is no gap in the thrust surface (A) of the joint between connecting rod (1) and connecting rod cap (2) and that these parts are in the correct position. And then, tighten the connecting rod cap bolts. If the connecting rod cap bolts are reused, measure the outer diameter. Refer to EM-103, "Inspection". Check and confirm the tightening angle by using Tool. Do not judge by visual inspection without the tool. After tightening connecting rod cap bolt, check that crankshaft rotates smoothly. Check the connecting rod side clearance. Refer to EM-103, "Inspection". Install oil pan (upper). Refer to EM-33, "Exploded View". Install rear oil seal. Refer to EM-70, "REAR OIL SEAL : Removal and Installation". Install flywheel or drive plate. Refer to EM-90, "Removal and Installation" (M/T) or EM-92, "Removal and Installation" (CVT). Install knock sensor (1) with harness connector facing toward the rear of engine. Do not tighten bolts while holding the harness connector. If any impact by dropping is applied to knock sensor, replace it with a new one. Check that there is no foreign material on the cylinder block mating surface and the back surface of knock sensor. Check that knock sensor does not interfere with other parts. Measure the clearance between thrust bearings and crankshaft arm when crankshaft is moved fully forward or backward using suitable tool (A). Standard and Limit : Refer to EM-123, "Cylinder Block". If the measured value exceeds the limit, replace thrust bearings, and measure again. If it still exceeds the limit, replace crankshaft also. 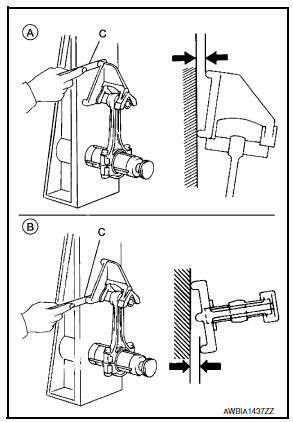 Measure the side clearance between connecting rod and crankshaft arm using suitable tool (A). If the measured value exceeds the limit, replace connecting rod, and measure again. If it still exceeds the limit, replace crankshaft also. 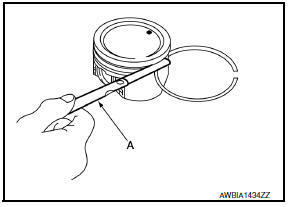 Measure the inner diameter of piston pin hole using suitable tool (A). Standard : Refer to EM-123, "Cylinder Block". Measure the outer diameter of piston pin using suitable tool (A). If oil clearance is out of the standard, replace piston and piston pin assembly. When replacing piston and piston pin assembly. Refer to EM-112, "Description". 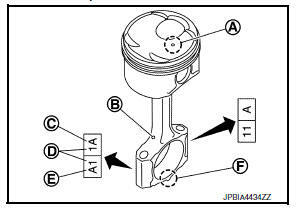 Piston is available together with piston pin as assembly. Measure the side clearance of piston ring and piston ring groove using suitable tool (A). If the measured value exceeds the limit, replace piston ring, and measure again. If it still exceeds the limit, replace piston also. Check that cylinder bore inner diameter is within specification. Refer to вЂњPISTON TO CYLINDER BORE CLEARANCEвЂќ. 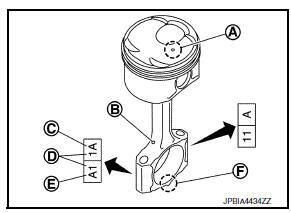 Lubricate with new engine oil to piston (1) and piston ring (2), and then insert (A) piston ring until middle of cylinder (B) with piston, and measure piston ring end gap using suitable tool (C). If the measured value exceeds the limit, replace piston ring, and measure again. If it still exceeds the limit, rebore cylinder and use oversized piston and piston rings. Check with a connecting rod aligner. Limit : Refer to EM-123, "Cylinder Block". If it exceeds the limit, replace connecting rod assembly. Install connecting rod cap (1) without connecting rod bearing installed, and tightening connecting rod cap bolts to the specified torque. Refer to EM-95, "Disassembly and Assembly". Measure the inner diameter of connecting rod big end using suitable tool. If out of the standard, replace connecting rod assembly. Measure the inner diameter of connecting rod bushing using suitable tool (A). If the measured value is out of the standard, replace connecting rod assembly and/or piston and piston pin assembly. If replacing piston and piston pin assembly. Refer to EM-112, "Piston". If replacing connecting rod assembly. Refer to EM-113, "Connecting Rod Bearing". Using a scraper, remove gasket on the cylinder block surface, and also remove engine oil, scale, carbon, or other contamination. Be careful not to allow gasket flakes to enter engine oil or engine coolant passages. Measure the distortion on the cylinder block upper face at some different points in six directions using suitable tools (A,B). 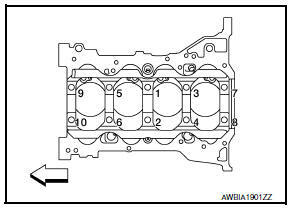 If it exceeds the limit, replace cylinder block. 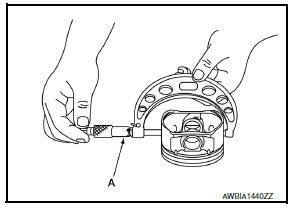 Install main bearing cap without main bearings installed, and tighten main bearing cap bolts to the specified torque. Refer to EM-95, "Disassembly and Assembly". Measure the inner diameter of main bearing housing using suitable tool. Measure the position shown [5 mm (0.20 in)] backward from main bearing housing front side in the 2 directions as shown. The smaller one is the measured value. When determining cylinder bore grade, measure the cylinder bore (B) direction at (D) position. Cylinder bore inner diameter : Refer to EM-123, "Cylinder Block". Out-of-round [Difference between (A) and (B)] Taper [Difference between (C) and (D)] : Refer to EM-123, "Cylinder Block". If the measured value exceeds the limit, or if there are scratches and/or seizure on the cylinder inner wall, replace cylinder block. Oversize piston is not provided. Measure the outer diameter of piston skirt using suitable tool (A). Calculate by piston skirt diameter and cylinder bore inner diameter [direction (B), position (D)]. If it exceeds the limit, replace piston and piston pin assembly and/or cylinder block. Refer to EM-112, "Piston". 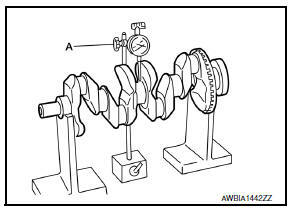 Measure the outer diameter of crankshaft main journals using suitable tool (A). If out of the standard, measure the main bearing oil clearance. Then use undersize bearing. Refer to EM-127, "Main Bearing". Measure the outer diameter of crankshaft pin journal using suitable tool. If out of the standard, measure the connecting rod bearing oil clearance. Then use undersize bearing. Refer to EM-127, "Connecting Rod Bearing". Measure the dimensions at four different points as shown on each main journal and pin journal using suitable tool. Out-of-round is indicated by the difference in dimensions between (X) and (Y) at (A) and (B). Taper is indicated by the difference in dimension between (A) and (B) at (X) and (Y). Limit: Out-of-round [Difference between (X) and (Y)] Taper [Difference between (A) and (B)] : Refer to EM-123, "Cylinder Block". If the measured value exceeds the limit, correct or replace crankshaft. If corrected, measure the bearing oil clearance of the corrected main journal and/or pin journal. Then select main bearing and/or connecting rod bearing. Refer to EM-113, "Connecting Rod Bearing" and/or EM-115, "Main Bearing". Place a v-block on a precise flat table to support the journals on both ends of the crankshaft. Place a suitable tool (a) straight up on the no. 3 Journal. If it exceeds the limit, replace crankshaft. 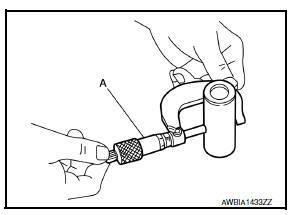 Install connecting rod bearings (2) to connecting rod (3) and connecting rod bearing cap (1), and tighten connecting rod cap bolts to the specified torque. Refer to EM-95, "Disassembly and Assembly". Measure the inner diameter of connecting rod bearing using suitable tool. Standard and Limit : Refer to EM-127, "Connecting Rod Bearing". If clearance exceeds the limit, select proper connecting rod bearing according to connecting rod big end diameter and crankshaft pin journal diameter to obtain specified bearing oil clearance. Refer to EM-113, "Connecting Rod Bearing". Remove engine oil and dust on crankshaft pin and the surfaces of each bearing completely. Cut a plastigage slightly shorter than the bearing width, and place it in crankshaft axial direction, avoiding oil holes. Install connecting rod bearings to connecting rod and cap, and tighten connecting rod cap bolts to the specified torque. Refer to EM-95, "Disassembly and Assembly". 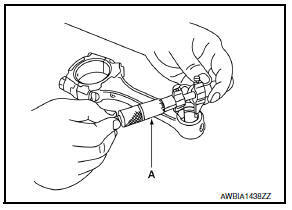 Remove connecting rod cap and bearing, and using the scale (A) on the plastigage bag, measure the plastigage width. The procedure when the measured value exceeds the limit is same as that described in the вЂњMethod by CalculationвЂќ. Install main bearings (3) to cylinder block (1) and main bearing cap (2), and tighten main bearing cap bolts to the specified torque. Refer to EM-95, "Disassembly and Assembly". Measure the inner diameter of main bearing using suitable tool. Standard and Limit : Refer to EM-127, "Main Bearing". If clearance exceeds the limit, select proper main bearing according to main bearing inner diameter and crankshaft main journal diameter to obtain specified bearing oil clearance. Refer to EM-115, "Main Bearing". Remove engine oil and dust on crankshaft main journal and the surfaces of each bearing completely. Install main bearings to cylinder block and main bearing cap, and tighten main bearing cap bolts to the specified torque. Refer to EM-95, "Disassembly and Assembly". 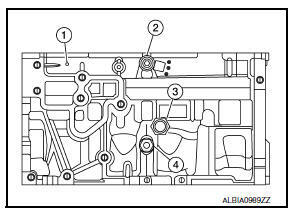 Remove main bearing cap and bearings, and using the scale (A) on the plastigage bag, measure the plastigage width. The procedure when the measured value exceeds the limit is the same as that described in the вЂњMethod by CalculationвЂќ. When main bearing cap is removed after being tightened to the specified torque with main bearings (1) installed, the tip end of bearing must protrude (B). Refer to EM-95, "Disassembly and Assembly". Standard : There must be crush height. If the standard is not met, replace main bearings. 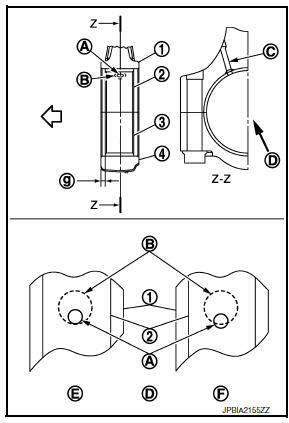 When connecting rod cap is removed after being tightened to the specified torque with connecting rod bearings (1) installed, the tip end of bearing must protrude (B). Refer to EM-95, "Disassembly and Assembly". If the standard is not met, replace connecting rod bearings. Measure the outer diameters (d1) and (d2) at two positions as shown. If reduction appears in places other than (b) range, regard it as (d2). If it exceeds the limit (a large difference in dimensions), replace main bearing cap mounting bolt with a new one. Measure the outer diameter (d) at position as shown. If reduction appears in a position other than (d), regard it as (d). When (d) exceeds the limit (when it becomes thinner), replace connecting rod cap bolt with a new one.